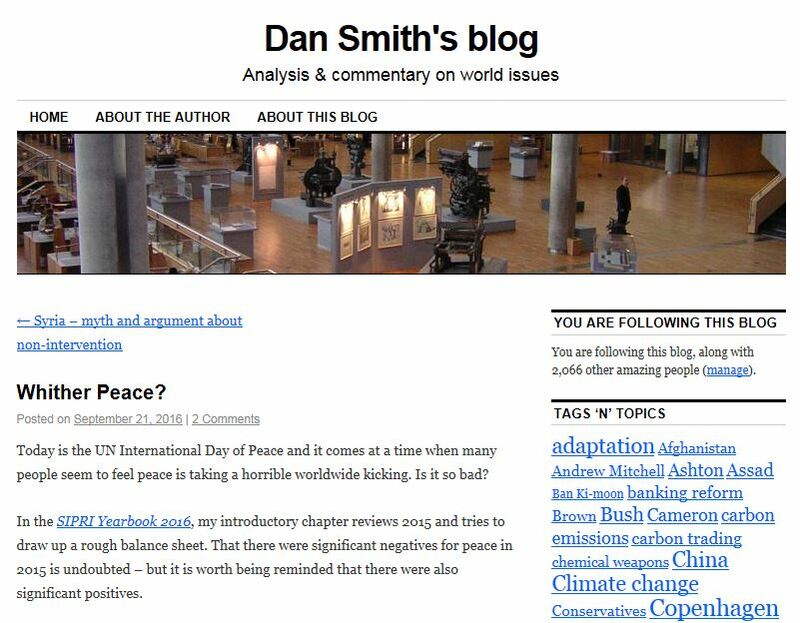 On the occasion of the UN International Day of Peace, Dan Smith (Director of the Stockholm International Peace Research Institute, Professor of Peace and Conflict Studies at the University of Manchester, and former Secretary General of International Alert) has uploaded an excellent blog post on the current state of global armed conflict and progress towards peace. There are some clear correlations with the conflict predictions and factors which are said to contribute to conflict risks, which are currently being posted to the Blackboard Discussion Board by newly-enrolled SCID students. I would suggest that while Colombia is one of the most positive current examples of how peace can be found in the most intractable of conflicts, there are still significant risks present in Colombia (notably high levels of organised crime and corruption, and massive socio-economic inequalities) which are not adequately addressed by the peace agreement and, if left unaddressed, may compromise the peacebuilding process. This entry was posted in Building Security and Justice after Conflict, conflict, peacebuilding, SCID Course, War and Peace and tagged conflict, peace operations, peacebuilding, SCID on September 21, 2016 by uolscid. In this commentary on Myanmar’s recent progress toward establishing democratic governance and ending decades-long civil war, I will try to look beyond the known facts into the background of Burmese politics that frames, directs and conditions the course of developments, but is also continuously influenced by them. That is why this environment is neither static nor monolithic or heterogeneous. I will pick up some pieces of this dynamic puzzle to better understand what is happening in Myanmar and, more importantly, why it happens as it does. In the course of four days, from 31 August to 4 September 2016, the government and military of Myanmar held a peace conference with rebel groups over the country’s future political and administrative set-up. The conference in the capital Nay Pyi Taw was the first broad based, inclusive of (almost) all stakeholders event dedicated to this issue in nearly seventy years, since gaining the independence in 1948. The importance of this event is difficult to overestimate. It was the largest and most representative forum bringing together government officials, members of parliament, political party representatives, military officers, and representatives of ethnic armed groups in decades. Its significance is twofold, given that it demonstrated the legitimacy and credibility of the first democratically elected government and set the course toward the implementation of the negotiated peace that shall result in a new, federal political and administrative organisation of the Burmese State. It was not perfect (what is in political realm? ), for it did not live up to (rather elevated) expectations of achieving tangible outcomes except for demonstrating commitment, formally launching the process, and offering all the sides an opportunity to share their opinion. But that is already a firm step forward, in a manner that appears to be characteristic of political processes in Myanmar—testing ground and moving from one milestone to the next as conditions allow. Conditions must be ripe for making a move to another milestone toward peace and democracy in Myanmar, and they grew so gradually over a number of recent years of painstakingly building momentum, to be ready by this point in time. — The military have made another step on their ‘roadmap’, by allowing the democratically elected government to take public office; in so doing they retained their power and control of certain decision-making domains (such as defence, police and border control where they continue appointing the ministers and their deputies). — The government is fresh and its de facto leader, Aung San Suu Kyi commands respect internally and internationally and enjoys credibility with majority of population; thus hopes and willingness to cooperate are high for the time being (this is not going to be always like that, because there will be unavoidable delays and failures in addressing the mounting problems that will eventually lead to certain frustration and disillusionment). — The rebels are exhausted and they realise that they have achieved maximum of what they could have secured through the armed conflict. It is not a secret to either side that violence leads to more violence which only aggravates the situation but does not bring any result in and by itself. Since the signing of National Ceasefire Agreement in October 2015 all but three rebel groups in the north have put the arms down. — This explains why all the rebel groups (even those who did not sign the agreement) agreed to its text last year. And in fact accepting the peace agreement is being kept firmly by the government and military, as a precondition for participating in the follow-up peace- and state-building process. On the other hand, the negotiation process was long enough (it took four years) for all the parties to hold internal consultations and to weigh all the pros and cons. In turn, the military’s powerful commander-in-chief, Senior General Min Aung Hlaing, and his deputy signing the agreement in person had demonstrated their commitment. — And finally, the process has got high level of attention and support from the international community. At the moment it is at its pick, which means strong political backing but also availability of financial and technical aid which are much needed to revitalise the economy and to address Myanmar’s numerous social problems (this should be taken with caution though, first, because of ever important to Myanmar strategic goal of balancing its relations with China, and second, recalling the waste in supply and spending when the country first opened for the external assistance in 2011, after the sanctions imposed back in the 1990s). The fact that the agreement signing ceremony last year was attended by ambassadors of forty-five countries, the UN and World Bank in presence and co-signed by six international witnesses (among them the most important politically and economically neighbours China and India, along with Japan, Thailand, UN and the European Union) already speaks for itself. This year, the UN Secretary-General Ban Ki-moon addressed the conference, while the former SG Kofi Annan will head a commission for examining the situation with Rohingya Muslims and offering recommendations. Any society represents a complex system due to broad variety of societal groups which constitute it and the diversity of their interests and intra-group and inter-group interactions (as stakeholders in an array of issues). Complex systems, as a rule, are characterized by the interaction of their components and therefore the resulting ‘emergent’ properties of the system as a whole cannot be derived from generalized quality of its components but reflect the properties of those numerous and multidimensional interactions between its constituent parts. Those interactions, in turn, tend to constantly change in their dynamics, directions, forms and magnitude. That is why it is so difficult to categorize any society, even when assessed against the criteria of one given category (for example, using political rights and civil liberties for judging the degree of democratic freedom). Now imagine how complex is society where one-third of population is comprised of ethnic minorities. Moreover, there are more than a hundred of those minorities living together in these territories literally for ages. Add seven decades of most recent violent confrontation between them and the government led by military junta (of ethnic majority)—a civil war resulting in further erosion of social fabric and deeply running mistrust, physical destruction, economic backwardness, poverty, massive scale human rights abuses, hundreds of thousands of refugees abroad and displaced people in-country, and more than one hundred thousand of fighters belonging to a dozen-and-half of armed rebel groups spread across the land (which are linked to each other but do not form a single cohesive entity, thus may act independently). Democracy and Peacemaking. It is impossible to meaningfully achieve one goal without attaining the other: there cannot be a democracy without equality and fundamental human rights and rights of minorities respected, and democracy seems to be the only system that can guarantee those rights to the Burmese society’s diverse populations. There are two processes running simultaneously in Myanmar, since its independence day. One is the process of political transformation (presumably toward democratic governance, but in a localised fashion). Another is civil war between the ethnic majority and minorities. In the shadows of it is taking place another localised violent conflict, driven by religious divides. These processes are intertwined, although may vary independently, and what happens is that only a solution (or rather, a set of solutions) that addresses core issues at the heart of them has a chance to be effective and sustainable. It is impossible to meaningfully achieve one goal without attaining the other: there cannot be a democracy without equality and fundamental human rights and rights of minorities respected, and democracy seems to be the only system that cannot guarantee those rights to the Burmese society’s diverse populations. This is a sketchy present-day portrait of Myanmar, formerly known as Burma, set within the country’s unique contextual features and underlying institutions. Take just some of them, most prominent ones, and you will see the random events, individuals and groups as parts and parcels of political processes occurring in their natural environment. The country has a long history of statehood—existed as an independent kingdom, at times strongly centralised, for centuries (since the mid of 11th century until British colonization in the end of 19th century). Therefore, sense of nationalism and pride of own history and traditions, in each ethnic group and nation-wide, runs very deep. Perhaps this is one reason that in spite of violent infighting, almost all the rebel ethnicity centred groups do not seek to secede but strive to have equal rights and autonomy thorough building a federal state within the present borders. They take pride of the fact that Burma did not join the Commonwealth because they ‘refused to accept the British sovereign as head of state’. On the other hand, the colonial rule not only disrupted the continuity of sovereign rule but also exacerbated and exposed the country’s major social vulnerability by stressing its inter-communal ethnicity based differences. This was recognised at the time of gaining the independence, and political equality was reflected in an agreement of domestic forces. Unfortunately this agreement was not implemented, thus effectively leading to armed conflict between the ruling majority and ethnic minorities. Religion (Buddhism) has been one of distinctive building blocks of identity in Burma over the course of its long history, and has greatly influenced the individual, group, and inter-community behaviour and relations. However, group identity is not a permanent ‘solid enduring fact’ but rather a ‘situational construct’ which, first, has many layers and, second, evolves as part of the advancement strategy in response to changing circumstances (for example, by changing the hierarchy of its ingredient parts/layers). Therefore the Buddhist identity has not always played a dominant or unifying role in inter-communal relations, especially in the framework of the civil war unfolding. In addition to ethnic diversity, there is a religious minority of Muslim population living in compact pockets; they are seen as aliens and discriminated against by nationalist Buddhists, at times brutally. In the western state of Rakhine, about hundred and twenty thousand Rohingya Muslims are living in displacement camps after being driven from their communities four years ago (it is also indicative that no one represented them at the peace conference). Economic inequality has been another driver of the conflict, since the minorities live in most remote and underdeveloped areas but also have been neglected by the central government for long. Decades of civil war have devastated the country’s resources and destroyed its economy’s productive infrastructure while creating the opportunities for illicit economic activities, especially drug related, thus contributing to the conflict’s sustainability. Myanmar has demonstrated that by following its own path it slowly by surely progresses toward the end goal. The goal itself is broadly defined; it is shaped and reshaped along the journey, with multiple intermediary milestones determining the pace, the direction and the current and possible future settlement formats. Its smooth transition from military rule to democratically elected government (even though with the power and special position of military constitutionally guaranteed) took too long in the eyes of many observers, but what is important is that it worked out and already started delivering its first results. Another process, of ending the civil war, has too, entered its maturity phase after many attempts, iterations, and prolonged negotiations. It well may be that, after decades of dominating mostly grim news Myanmar is about presenting to the world a lesson on how internal differences could be overcome. Whatever comes in the end (both in terms of governance and peace), is going to be a Burmese product, a local model that may not (and most probably because of that won’t) fit into Western or any other models of democratic government and peacemaking or work as a model for replication elsewhere. Revitalisation of a troubled society must come from within if there is to be a meaningful fulfilment of its various communities’ needs and aspirations and a workable mechanism to accommodate their diverse relationships. I am convinced that the Burmese (and similar) experiences of dealing with their problems deserve to be closely studied and learnt from. I see the success factors of this approach in its domestically-driven energy and localised solutions, built with recognition of political culture, traditions and institutions, with adjustments made to local contexts and, through this interaction, influencing those contexts to allow the change occurring and taking root. The revitalisation of a troubled society must come from within if there is to be a meaningful fulfilment of its various communities’ needs and aspirations and a workable mechanism for their diverse relationships. The country makes cautious steps in progression and there is a long way to go. But one thing is clear today is that they do it their own way in Myanmar, and even if it does not match everyone’s expectations or standards abroad, it may work well for their people. And that’s what matters in the end. About the Author: Dr. Elbay Alibayov is an international development professional specialising in state-building and political processes in post-conflict countries. He has worked in Iraq, Afghanistan, Bosnia and Herzegovina, and Azerbaijan. Being posted in the field (such as office in Srebrenica) and headquarters of international projects and missions, he has designed, implemented and overseen a broad range of strategies and local and nation-wide initiatives, and have chaired and participated in the work of civil-military groups, political coordination boards at all levels. This entry was posted in Building Security and Justice after Conflict, peacebuilding, War and Peace and tagged conflict, democracy, local ownership, peace, peacebuilding, security on September 20, 2016 by PolicyLabs. We like models, don’t we? We claim that they represent a simplified reality that helps us make sense of it and serve as guidance for taking action. Accepted, it does in many instances (especially in well ordered situations when the cause-effect relations are observable and/or future developments are mostly in line with the extrapolated past trend). But what happens when some developments do not fit into any existing model? Then in a customary manner we are quick to dismiss them as anomaly that has to be brought back to the norm of the known models. Take, for example the notion of democracy promotion and democratic transition. All former colonies and, in the same vein, post-communist countries were expected to make a quick and effective transition from their non-democratic regimes to elected and then liberal democracies. It was assumed with little consideration given to unique cultural features of those societies and to their readiness to do so. The reality has shown that this is not the case. Then the notion of ‘grey areas’ was introduced to explain that those countries which did not make it to democracy were lost somewhere in-between but eventually would have to be driven on the predefined route, or otherwise they risk of reverting back to authoritarian rule—with no third option allowed. Not necessarily, it appears—at least not in such a simplistic manner. What we failed to appreciate is the difference between the commonly accepted set of defined democratic values and the variety of forms that democracy as a governance regime based on those values may take, depending on local political culture and institutions. Also, the mechanistic understanding of such ‘transition’ fails to take into consideration that in order to become sustainable, the reforms will demand a cultural change which time-wise could be expected to take no less than a generational span (independently of the amount of effort, money and pressure invested externally). And finally, we tried to model those transitions as flawless and irreversible—yet another failure to appreciate that even liberal democracies keep evolving and there is nothing surprising if at times this process turns into zigzagging and iterations, in an attempt of finding the optimal adjustment of political system to the changed external circumstances, let alone high-impact ‘surprises’. (There are countries, such as Argentina, known for this kind of iterative democratic development. And it seems that the outcry of ‘illiberal democracy’ in Hungary and Poland is exaggerated; the policies of their elected governments signal more of a search of effective adaptive strategies in the face of daunting economic and social problems rather than of turning back to European liberalism). The same holds true with regard to ending violent conflicts and peacebuilding. So frequently we tend to overestimate the effects of globalisation and see the interaction between local and global as a one-way street, although the evidence suggests that the influence is reciprocal, and to be absorbed by local contexts the global trend (or external influence) has to be ‘glocalised’. On the other hand, there is another fallacy of assuming that the solutions offered (if not imposed) by the developed/industrialised world actors are superior to those home-grown initiatives of local political players in the developing countries. Even driven by the best of intentions, external interventions may distort the inherent logic of internal conflict, which is a product of an interaction of many factors acting within a unique set of local political, economic, social contexts. Locally owned democratic reforms and peacebuilding processes may not look as logical and attractive as externally promoted/imposed models, but they are effective–not the least because they derive from and are built in local culture, contexts, and institutions. In any case, whether it is democratic reform or ending the conflict–only when the solutions are driven and owned by domestic actors, there is a chance that the meaningful development (including constitution building) or peace deal would be concluded, and respected and implemented afterwards. And we have to be ready to accept that it may take decades for them to come to realise that only through cooperative strategies they would achieve the final settlement (which is never a zero-sum outcome but something that demands concessions from all sides but still they can live with that)—if, of course, the democratic state and sustainable peace are the final goals and the contest/infighting has not turned into a self-sustaining endeavour when keeping the confrontation and thus status quo going is an end it itself and not a means to achieving the goal. That said there are various types of internal conflict and a variety of conflict drivers interact in any given violent confrontation, and they are set in a certain external geopolitical field with many interests—so I am far from drawing yet another model here, but rather intend at pointing to some fundamental issues which have been somehow neglected in the international community’s involvement in domestic violent conflicts and civil wars across the globe. Whether ‘give war a chance’ or ‘give peace a chance’ should not be formulated as a dilemma, in my opinion. There is another dimension to resolving internal conflicts, which may well amalgamate these two within a flexible, adaptive and ecologically rational approach—as demonstrated by some successful experiences in Latin America, Africa, and Asia. Among most recent are Colombia and Myanmar—they may not look as attractive as models but they are real and effective. Not such examples in the Middle East yet… or are they in making? This entry was posted in Building Security and Justice after Conflict, War and Peace and tagged conflict, development, governance, peacebuilding, strategy on September 17, 2016 by PolicyLabs. What is happening in Syria today is not yet ‘another violent conflict fought in the volatile Middle East’. It started five years ago in line with scenario played in many other places over centuries. However, due to internal political dynamics, regional rivalries and cross-border influences, competing geopolitical interests of many actors, as well as the active presence of global terrorist organisations this conflict has grown in something the world has not seen before—it is surely moving toward becoming a Perfect War, the kind of world war of the twenty-first century. Ending the Syrian War by traditional methods is already impossible; it has been proven by numerous failures and the deterioration further into the abyss of uncontrollable fighting. New approaches must be explored and tested on the ground—this will demand new, unorthodox ways of decision making, cooperation, and implementation. There are many wars fought in Syria today, with different agendas and actors involved, but all have one thing in common—they are driven by political power and influence. These wars become increasingly integrated and evolve toward becoming one single multifaceted violent conflict, which no one can control and with no end in sight. Solution to this conundrum is only one—to abandon the idea of achieving a comprehensive peace in one move and instead decompose the problem into small parts, and implement sets of limited tasks to effectively address them, in order to progress toward the ultimate goal over time. There are many wars fought in Syria today, with different agendas and actors involved, but all of them are about political power and influence. Today, Syria is a battleground for a number of wars. Each has it its own contexts, underlying conflict drivers, prize at stake, and actors involved directly and covertly. They are fought by a large group of local, regional, national, and transnational actors. Many are involved in more than one war and the aims they pursue and alliances they make in each war are different. Therefore the phrase Syrian War refers to conglomerate of wars closely related to and reinforcing each other. Three wars are fought for direct power control in Syria. One is civil war. It started from the violent confrontation between the opposition-turned rebels and the authoritarian regime of Bashar al-Assad, in 2011. The government does not intend to give up the power while the opposition wants to take it all. This zero sum game has a number of implications. More protracted it is, more resources it demands, more atrocities are committed, and fewer chances are left for its ultimate resolution (which extends to post-war stabilisation, reconciliation, and rebuilding the country). Another war is initiated by militant Islamist groups who took advantage of power vacuum and mess created by civil war in pursuit of their own goals: ISIL to establish a self-ruled caliphate; al-Qaeda and other jihadists to exert influence over Syrian state. Originally it alien to Syrian political context, but in the course of five-and-half years managed to become part of it. Initially in the shadow of these two but growing prominent and creating yet another set of proxy wars is the war of Syrian Kurds. The Kurds, too, aim at reshaping the power balance in Syria in their own favour—getting a recognised autonomous region. By establishing Rojava under their control in the north, they advanced their cause but further complicated the issues for external actors working to end the war (e.g. two NATO members, Turkey and the US). Proxy wars derive from those three wars and are overlapping, confusing and conflicting with each other. Take a few examples. Regime of Assad is supported by Russia and Iran, while the opposition is backed by the US, Saudi Arabia and Persian Gulf countries. On the other hand US, Turkey, Russia and Iran fight against ISIL. Saudi Arabia also backs non-ISIL Islamist groups which in turn support al-Qaeda’s affiliate. It appears that Saudi Arabia and Turkey are also backing jihadist groups that fight Assad. The US strongly backs the Kurdish forces, but Turkey has drawn its troops to the north to counter them under premise of fighting ISIL. And the list goes on and on, with these and many other smaller players entering the game. The wars become increasingly integrated and evolve toward becoming one single multifaceted violent conflict, with no end in sight. The wars overlap geographically and in their drivers, incentives, and aims. They overlap in terms of actors involved, from government forces, to various governments sponsored militia, to mercenaries and terrorists on almost all sides. They keep adapting to fast changing circumstances on the ground, pursuing their goals by multiple tactical means, switching sides, merging campaigns with those whom they have seemingly irreconcilable differences at strategic level—and thus contributing to increased integration of wars. The uncompromising stand of Syrian government and opposition only strengthens the hand of those who want to proliferate from this situation, by offering them an opportunity to dig deeper into political process at the expense of Syrian moderate opposition groups. Jihadists gradually become part of the civil war, mix with rebels and thus pose a risk of highjacking the political contest. Syrian opposition movement has not been homogeneous from the outset. However, certain categorisation of them, in terms of ideologies and the means they employed was still possible. Today, it is very difficult to distinguish between ‘moderate’ rebels and ‘extremists’ as the former are increasingly radicalised and in desperation many of them join forces with jihadist groups. The result of this integration is that, by compensating each other’s limitations, the Syrian wars evolve into one self-sustaining conflict—the Perfect War—that is fought for its own sake, is self-sufficient in terms of attracting resources and satisfying its needs, and can last permanently. Solution to this conundrum is only one—to abandon the idea of achieving a comprehensive peace in one move and instead decompose the problem into small parts and develop and implement a series of limited tasks to address them. The situation in Syria is out of control and there is no such power in the world—individual or collective—that can control it. Before the full integration of Syrian wars a fundamentally new approach to finding solution must be employed. In complex situations with high risk and uncertainty, many alternatives, and small information available the decision making shall be simple and tactical. For that, small manageable tasks are adapted to environment and then multiple moves carried out simultaneously or subsequently, in various places and directions. Another condition is that the tasks shall be decoupled (but well coordinated) to extent possible so that to isolate their failures from affecting other tasks. This is where less becomes more, in terms of outcome. Interestingly, this approach is already being tested in the Syrian war framework. Take, for example, the successful attempts of US and Russia (in spite of principal differences in stands with regard to the future of Assad) to establish a ceasefire in Aleppo, to allow delivering humanitarian aid and to share the US intelligence in order to target Jabhat Fateh al-Sham. Or consider the recent deal between the Syrian government and the rebels, on surrendering the Damascus suburb Daraya. These examples prove that small-scale, localised tasks are manageable. The adversaries have been ahead of the game in terms of decoupling, though. Their recent manoeuvring with rebranding Jabhat al-Nusra into Jabhat Fateh al-Sham (thus pretending to dissociate from al-Qaeda) and subsequent ‘defection’ of a fraction from it to create their own group clearly demonstrate that. The goal of establishing lasting peace in Syria can be achieved by redefining the engagement strategy. Large scale military campaigns are one of a means to an end: pulling out ISIL form occupied territories and decapitating militant groups are necessary but not sufficient. Neither are high-level (presumably representative and all-inclusive) peace talks. The daily job of progressing toward the desirable end-state in Syria is through numerous, random, tactical interventions aimed at searching for, understanding, and building on the existing opportunities for peace and strengthening local resilient capacity. Full version of this post was published on PolicyLabs: A Potential Game Changer in Syrian ‘Perfect War’. This entry was posted in conflict and tagged conflict, Middle East, peace, peacebuilding, political crisis, Syria on September 15, 2016 by PolicyLabs. On 24 August, Colombian Government and the Revolutionary Forces of Colombia (Fuerzas Armadas Revolucionarias de Colombia, FARC) have reached a comprehensive peace agreement. It is too early to celebrate the end of the long-lasting war—the deal has to be ratified through referendum and even then its success will be conditional on implementation. At this point, we can reflect on some insights from this 52-year-long conflict and looking forward try to anticipate what we have yet to learn from the Colombian experience. – Each conflict has its own internal dynamics (which are shaped and fed by local political institutions and contemporary contexts). Any conflict therefore may take as long as its internal logic dictates, be iterative, with many failed attempts to establish peace. – Whatever external influences they will have an effect on the conflict as long as its contextual fabric absorbs and localises them. This makes any given conflict unique, and therefore no imported solutions will work without being first adapted to and ‘digested’ by local contexts. The same goes for ‘lessons learned’. – Interventions of external actors tend to complicate the situation and make the conflict’s natural maturation process confused. Active interventions (except for humanitarian aid and facilitation of peace talks) complicate the conflict for many reasons; they also tend to transfer into proxy wars, given different interests and agendas of external actors. – Military interventions of external (individual or collective) actors must be avoided, except for limited tasks by international stabilisation forces. Even then, the UN mandate should be limited to such tasks as ensuring cessation of hostilities, maintaining ceasefire, enabling delivery of humanitarian aid, etc. – For a comprehensive peace deal to materialise the conditions must be ripe, first of all the goodwill of both sides along with their readiness to make concessions. Not an easy task considering that there is never full agreement in either camp, as ensuring coherence is always a challenge. – It also takes a leader who is brave enough and ready to put his/her political career at risk of concluding the deal—which is always subject to imperfection, scrutiny, disbelief, and controversy, and won’t be met by all people positively. There are many questions and many concerns. Not many answers. Quite understandably—only practice will provide them (and even then, these would not be timeless truth). – Does the peace agreement mean the end to hostilities between Colombian security and all rebels? Bilateral permanent ceasefire between FARC and the government became effective as of Monday, 29 August. Other rebel groups are not part of the peace deal and some will seek strengthen their ranks at the account of FARC members who disagree with disarmament. Parallel talks are planned with the National Liberation Army (ELN), the second-largest guerrilla group. how FARC members go through the process of reintegration into society. financial problems with regards to investing into reintegration, public services and rebuilding infrastructure in former FARC areas. socially: adapting to new places if relocated (especially with families), finding their new role in community life. complying with transitional justice measures (former guerrillas but also security officers facing prosecution). political: to respect the democratic process and choice of Colombian people in terms of new government priorities (including in foreign policy), as influenced by FARC’s participation in the legislative and executive. aid coordination: to ensure maximum possible level of coordination between development agencies, sponsors, implementers in order not to confuse and harm the otherwise sensitive political processes of disarmament, demobilisation, reintegration. – What are challenges to international development experts deployed to Colombia? project owners: development specialists shall be allowed more independence in decision making, thoughtful experimentation, and flexible forms of planning, delivery and monitoring—adapted to local circumstances. There is a long way to go for Colombia in terms of peacebuilding, and for all those who want to make violent conflict there and elsewhere on the face of the Earth part of history, not future. Understanding local contexts, making timely adjustments, and focusing on the drivers of change can greatly help making this path more effective. This entry was posted in Building Security and Justice after Conflict, conflict and tagged conflict, peace, peacebuilding on September 14, 2016 by PolicyLabs. This is the 14th Online Guest Lecture by members of the SCID Panel of Experts. Steven Smith MBE presents a lecture entitled The Global Humanitarian Harm from Improvised Explosive Devices (IEDs). Steven Smith is the Chief Executive of Action on Armed Violence (AOAV), a UK-based, international NGO. In this role, he has overseen a broad range of activities, including agricultural training for former combatants in Liberia, landmine clearance in Western Sahara, arms control measures in Sierra Leone, and armed violence reduction programmes in Burundi. In this Lecture, Steve talks about the role of his organisation, AOAV, in mine action and the global threat posed by IEDs. Steve discusses the number of casualties and how casualty rates compare over time, in different countries, and according to the type of weapon used. The Lecture also considers the different users and primary target locations, as well as detonation methods (for example, suicide attack or victim-activated). The Lecture refers to various incidents (such as the Moon Market bombings in Lahore and suicide bombings in Nigeria). Steve’s analysis shows that IEDs are the weapon of choice for non-state actors, civilians are casualties more often than armed actors, and that the worst attacks happen in populated areas. Steve also underscores that behind each statistic is a person killed or injured. Steve also draws attention to the fact that harm is not just physical: commerce, infrastructure, education, and families all suffer from the use of IEDs. Steve draws the Lecture to a close by analysing what can be done to address the threat posed by IEDs, concluding that key preventative measures include stigmatisation, control of precursor materials, and security of military stockpiles. Click below to access Steve’s Lecture. NB Should the presentation not run automatically or the audio not work, please click ‘Save As’ (and then open once you have saved on your computer) rather than ‘Open’. Alternatively try a different browser (Firefox rather than Internet Explorer). Please submit any questions or comments within the next two weeks for Steve’s attention and/or discussion by other SCID Panel members, students and staff. This entry was posted in Building Security and Justice after Conflict, conflict, Improvised Explosive Devices, Mine Action, SCID Panel of Experts and tagged Civilians, conflict, IEDs, Mine Action, peacebuilding, SCID, SCID Panel of Experts, security, uolscid on May 23, 2016 by uolscid. With kind permission of Iain Blackwood (SCID student March 15 intake) and Conor Foley (member of the SCID Panel of Experts), here is an excellent photo of both of them when they recently met a couple of months ago in Kabul, Afghanistan. Coincidentally, they have met a couple of times while they were both working in Afghanistan, and spoke about the SCID Course and SCID-related topics. It is also credit to Conor that Iain decided to choose the SCID MSc course, after talking to Conor about which Master’s course to pursue when they met early last year. It’s a small world and great to hear how often the paths cross of those affiliated to the SCID Course. Thank you very much for sending the photo, Iain, and for advocating on behalf of the SCID Course, Conor. It’s great to hear such stories and also see photos of SCID students, alumni and Panel members in the field or meeting together – so please do continue to send and I’ll upload them to the SCID Blog as I’m sure others are equally delighted to see them. This entry was posted in SCID Course, SCID Panel of Experts, SCID Students, Studying and Working in the Field and tagged conflict, peacebuilding, SCID, SCID Panel of Experts, SCID Students, security, uolscid on May 4, 2016 by uolscid.